Astronauts David Scott and James Irwin would spend 3 days on the moon and 18 1/2 hours out on the moons surface. 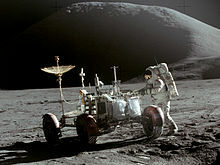 On this day in 1971 the Lunar Rover was used on the moon for the first time. helped with exploration a lot – still could not get far enough away so that they could not walk back should trouble arise.